A new kind of battle is going on out there at the moment. 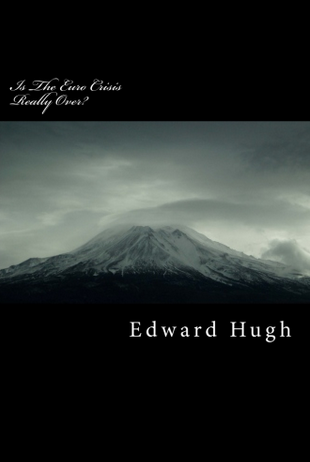 In what must surely be a new twist to the old dialectic of blow against blow argument, a combination of the internet age and sophistocated data management software is adding an additional and striking dimension to the current crisis debate, let's call it the birth of the "charts war". 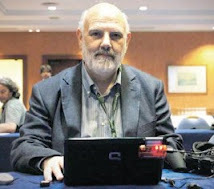 I think you could safely say Paul Krugman kicked off the latest round off, with this simple blog image post. 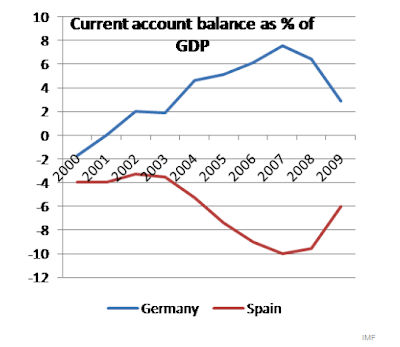 Spain, we are informed is not so badly off, since Italy's position is much worse. 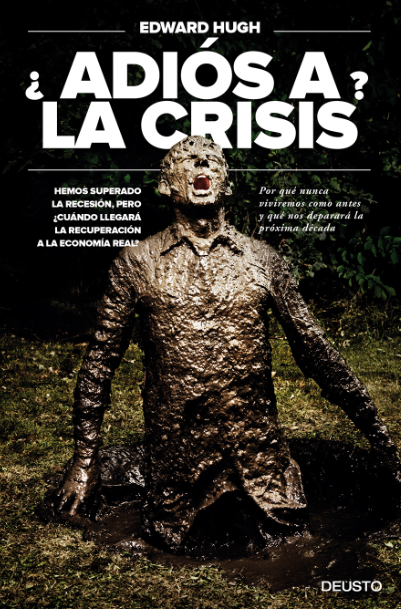 Even more to the point, adding 3 million or so unskilled workers to the dole queues, and closing down a large chunk of Spain's core construction industry (driving the unemployment rate up to 19.5% in the process) has been extremely beneficial, since cleaning out all those low productivity, unskilled workers has meant that the productive power of the rest looks a lot better (since average productivity of those in work has risen). But isn't this just where the fiscal deficit issue comes in? 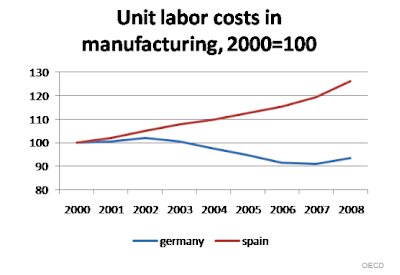 These workers are still being supported by the rest via the Spanish system of employment benefits, so the productivity improvement (as far as Spain as a whole is concerned) is simply an optical illusion. This is a point that Krugman could have picked up on but didn't, although he did follow through with a further post full of very revealing charts. 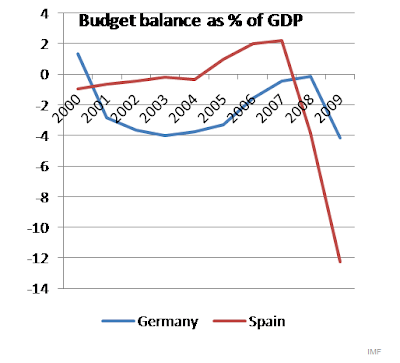 The core issue here is that the problem Spain faces, as Paul stresses, is not essentially a fiscal one, a point which may be clearly seen in the following comparison of German and Spanish fiscal deficits over the last decade. 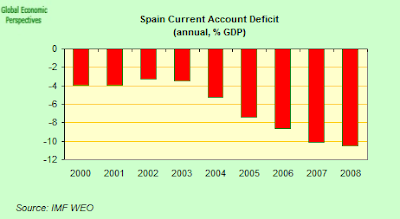 As he shows, Spain had no fiscal problem till the housing boom went bust. No of course, the need to prop up the economy, and support all the "unproductive" labour which doesn't show up in the unit labour costs chart is producing a massive fiscal deficit. 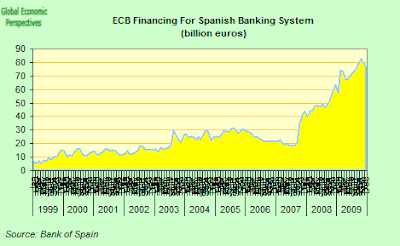 Thus the fiscal issue in Spain is a symptom, not a cause. 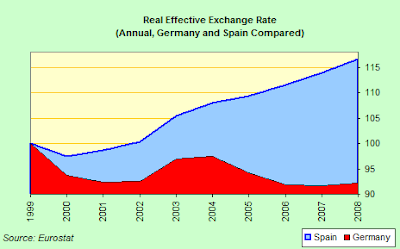 The root of the problem lies in the structural distortions produced by the massive overheating of the economy during the boom years, an overheating which lead to excessive inflation, large-scale dependence on imports, and a complete loss of competitiveness in the non-tradeable sector - a loss of competitiveness which even the Kingdom of Spain accept.The problem with the Spanish argument is that it seems to neglect the rather inconvenient fact that those workers who are deployed in the tradeable sector also eat bread and go to hairdressers and ride in taxis and buy or rent homes just like everyone else. 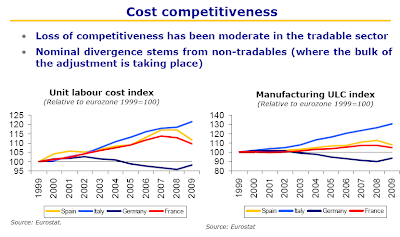 So they themselves need to pay prices set in the non-tradeable sector, and their salaries have to reflect this. 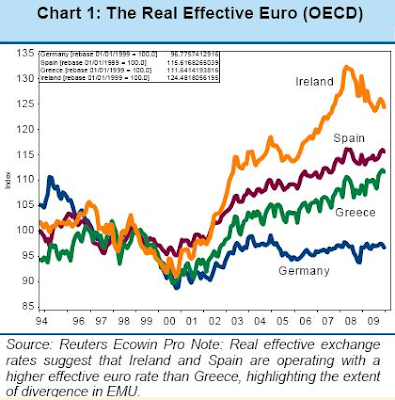 Hence a problem in non-tradeables becomes a much more general one. And it shows up, naturally enough, in the current account balance. So essentially the issues is this one. 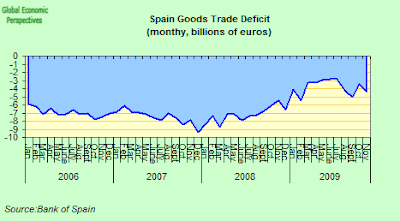 Spain's economy will not recover, and return to growth till Spanish products become more attractive in price terms, and this only means one thing: some sort of internal devaluation is inevitable, and all the talk about an exclusively fiscal correction is simply an attempt to get rid of the smoke without going to the trouble of extinguishing the fire which is producing it.